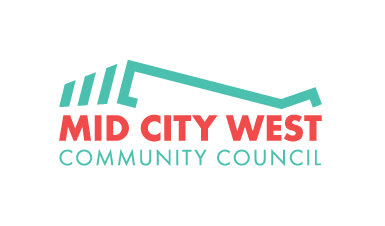 Planning and land use issues will dominate the Tuesday night meeting of the Mid City West Community Council when five items are scheduled for consideration. The Board will consider a “MCW – Town and Country Vision and Goals” document to focus discussions on concerns related to the proposed development of the Third Street site near Fairfax Avenue. The Planning and Land Use Committee (PLUC) created the document with input from community members. Other planning items on the agenda include a proposal for construction of a 50-unit mixed-use project on Third Street west of Fairfax, and the sale of liquor at two restaurants – Tasty Noodle on Third Street and Rascal on La Brea. The meeting will take place at 6:30 pm at the National Council of Jewish Women, 543 No. Fairfax Avenue. 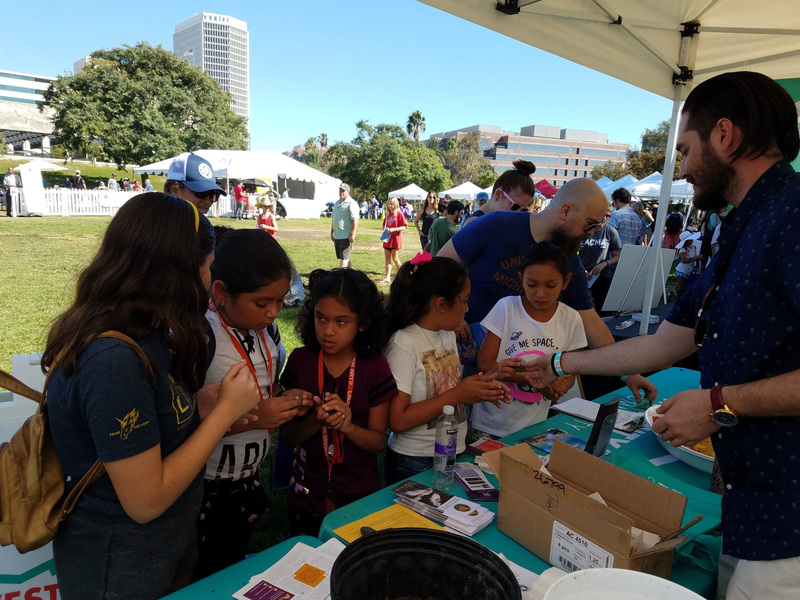 Hundreds of attendees at the September 22 TarFest at the La Brea Tar Pits stopped by the Mid City West Community Council booth and enjoyed snacks, drinks and the Seed Bomb Making Workshop while also being introduced to MCWCC and the Neighborhood Council system. The annual event “Excavating Future Culture on the Miracle Mile” included lots of live music and artwork being created on the spot. 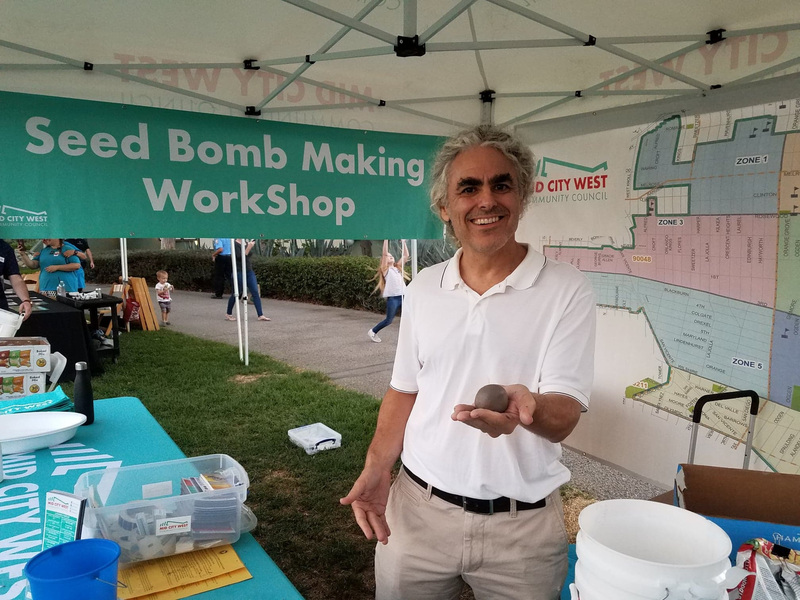 Among various giveaways being offered included the Mid City West seed bombs – flower seeds surrounded by dirt and encased in clay. When left outside the clay disintegrates and flowers begin to sprout. 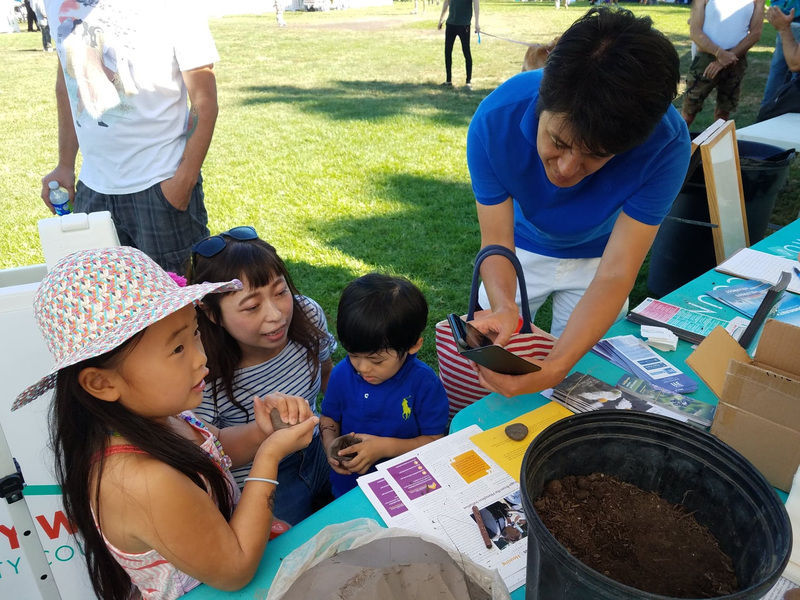 Visitors of all ages enjoyed getting their hands dirty and crafting their own seed bombs with CA Native wildflower seeds provided by the Theodore Payne Foundation. Among the crowds who attend the event are many people who live in the Mid City West territory. Board members who spent part of the day in the booth interacting with visitors were Keith Kirkwood, Abe “Mo” Langer, Steve Luftman, David Mann, Marc Sinnott and Don Whitehead. Communications & Outreach Committee stakeholder member Joanna McCallum was also an active participant. 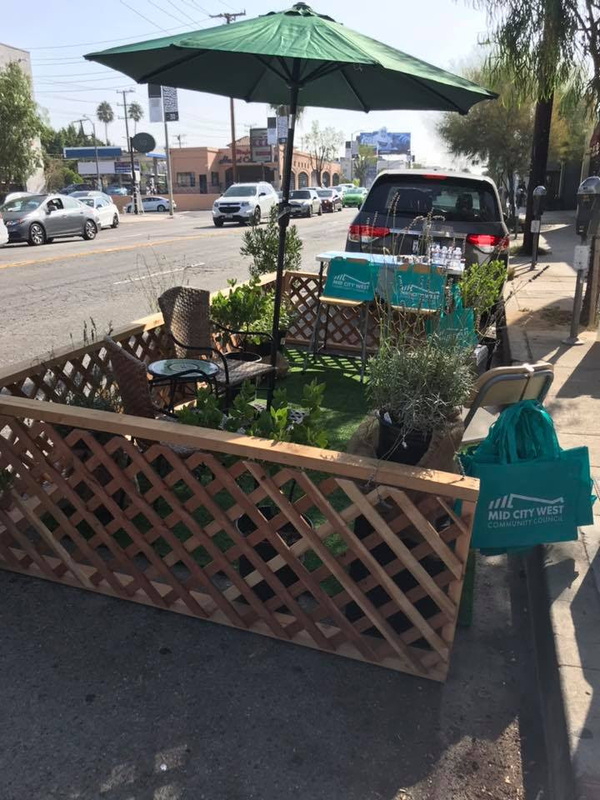 For the fifth year in a row Mid City West participated in the international Park(ing) Day event – taking over a few parking places on various streets to create temporary mini-parks. 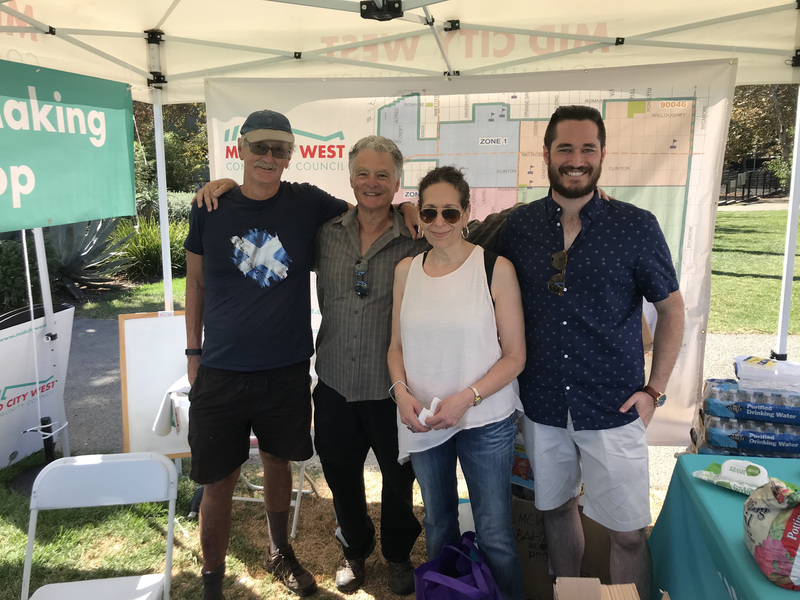 This year’s Mid City West locations for the September 21st event were at Sal’s Restaurant on Melrose Avenue and Gelateria Uli on Third Street. Staffing the two sites were board members Mo Langer, Andy Meselson, Taylor Nichols and Scott Sale, and stakeholder member Amy Goldenberg. 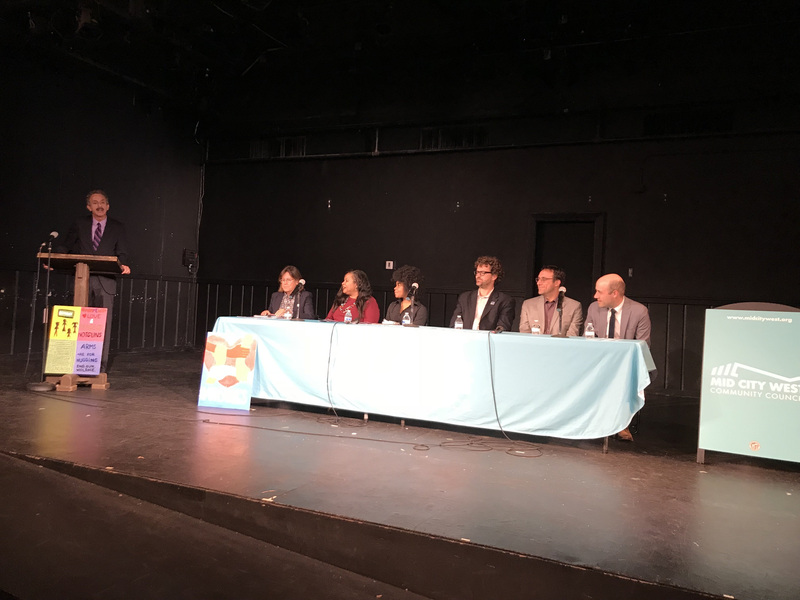 City Attorney Mike Feuer presented the recommendations of his Blue Ribbon Panel on School Safety on September 12 at a school safety forum sponsored by the Mid City West Community Council in partnership with the City Attorney’s Office and Greenway Arts Alliance. The City Attorney’s Blue Ribbon Panel, established after recent tragic shooting events on campuses, met eight times over the summer to broadly consider school safety from the perspective of law enforcement, school design, gun storage at home, and student relationships with adults on school campuses. Feuer’s presentation at the Mid City West event was followed by a panel discussion of the recommendations and school safety in general. Participants were two school safety prosecutors from Feuer’s office, Sharee Sanders Gordon and Jaquelyn Lawson; two members of the Blue Ribbon Panel, United Teachers of Los Angeles vice president Daniel Barnhart, and architect Michael Pinto; Fairfax High School student Amari Williams; and Mid City West Chairman Scott Epstein. The event, at the Greenway Court Theatre at Fairfax High School, was followed by a reception with food and drinks generously donated by Canter’s Deli, Pita Bar & Grill, Prime Pizza and Sweet Chick. In an effort to provide more information about the members of our Board this issue of our newsletter continues a series of profiles. It is hoped that through these brief profiles other board members and the community members we represent will get to know us better. It is likely safe to say that Charles Lindenblatt has attended more Mid City West Community Council meetings than anyone else. He has also likely served on more committees than anyone else. He was there during the pre-certification process, although not part of the certification board, and was elected as a renter’s representative in the first election in January 2003. After a brief hiatus from the board he was appointed an at large representative in 2004 and served on the Board until 2016. He now is returning as a business representative, having been elected to fill a board vacancy. His several years of involvement with Mid City West has included working on the Executive Committee as First Vice Chair and Secretary. He has been chair of the Bylaws/Grievance Committee and the Election Committee and served on other committees including Planning and Land Use, and Public Policy. When Charles was born his family lived in the Pico-Fairfax area and then they moved to the St. Louis area for a few years. By the time he was in the third grade his family had moved to the Beverly Grove area where he still lives. He attended Hancock Park Elementary School, John Burroughs Junior High and Fairfax High School. He then went to college at Northwestern earning a Bachelor’s degree in Economics and Political Science, and received a Master of Public Policy degree from the University of Southern California Sol Price School of Public Policy. He still roots for the Northwestern Wildcats football team and for the Dodgers. Past involvement with other organizations has included the Los Angeles County Young Democrats and the 42nd Assembly District Democratic Committee; and Greater Los Angeles Area Mensa (GLAMM). Charles’ roles in the regional Mensa organization has included serving as Administrative Vice Chair. He listens to good deal of radio, particularly news talk and sports talk, and also likes to keep up on current affairs by following the news on the internet. 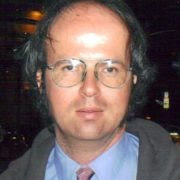 His work live has focused on “economic and public policy analysis and research.” He has primarily done economic analysis, public policy analysis and statistical analysis in a variety of settings including work for the UCLA Anderson Forecast, the RAND Corporation and the Milken Institute. “In the course of my community council service, at one point I realized that with my background and skills, I could contribute in a major way to analyzing land use issues.” This led to very deep dives into environmental reports on the Hollywood Community Plan, and the proposed Academy Museum of Motion Pictures. 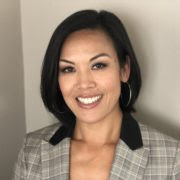 That endorsement of her adopted city by Thao Tran, newly appointed Mid City West board member, can certainly be seen in her own background, experiences, interests and career. Born in Vietnam, Thao immigrated to the US as a toddler with her family during the fall of Saigon in April 1975. She was raised in Torrance and then attended the University of Southern California, earning a Bachelor’s degree in Economics with a focus on Applied Mathematics. This was followed with a Masters in Business Administration at UCLA’s Anderson School of Business. “Although I went to USC and UCLA, I only root for the Trojans! I’m also an LA Kings fan to keep my household happy. “ That household involves life partner Matthew Carpenter, an entertainment professional, and two cats. She recently joined Ashkenazy Acquisition Corp, the owner/operator of the Beverly Connection. She had helped negotiate the sale of the property, and had previously held positions with other LA firms, Caruso and EJM Development. In her free time Thao enjoys “the most of what LA has to offer.” She enjoys seeing performances of “all types of live music at LA’s numerous venues from summer concerts at the Hollywood Bowl to live performances at the El Rey Theatre or the Hollywood Cemetery.” You might also see her at the Los Angeles County of Art or one of LA’s farmers market, perhaps gathering ingredients for dinner. And now added to her busy life is Mid City West. She decided to run for a board seat through her involvement with the Miracle Mile Residential Association.